Miller Park is the site of the matchup between the Los Angeles Dodgers and the Milwaukee Brewers on Friday, June 2, 2017. The probable starting pitchers are Clayton Kershaw for the Dodgers and Jimmy Nelson for the Brewers. Los Angeles opens at -210 while Milwaukee opens at +194. The Dodgers have a 23-30-3 over/under record and a 23-33-0 run line mark. The Brewers are 34-19-0 against the run line and have a 31-20-2 over/under record. The Dodgers have a 33-21 overall record this season. Starting pitcher Clayton Kershaw has a 7-2 record with an earned run average of 2.37 and a WHIP of 0.95. He has 78 strikeouts over his 76 innings pitched and he's given up 62 hits. He allows 7.3 hits per 9 innings and he has a FIP of 3.09. The bullpen has an earned run average of 2.67 and they have given up 142 base hits on the year. Teams are hitting .211 against the bullpen and they've struck out 210 hitters and walked 53 batters. As a team, Los Angeles allows 7.7 hits per nine innings while striking out 9.4 batters per nine innings. They are 1st in the league in team earned run average at 3.2. The Dodgers pitchers collectively have given up 411 base hits and 172 earned runs. They have allowed 50 home runs this season, ranking them 30th in the league. Los Angeles as a pitching staff has walked 147 batters and struck out 503. They have walked 2.7 men per 9 innings while striking out 9.4 per 9. They have a team WHIP of 1.16 and their FIP as a unit is 3.28. As a team Los Angeles is hitting .258, good for 10th in the league. The Dodgers hold a .428 team slugging percentage and an on-base percentage of .340, which is good for 5th in baseball. They rank 17th in MLB with 8.6 hits per game. 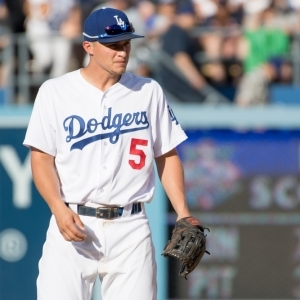 Corey Seager is hitting .286 with an on-base percentage of .390. He has 54 hits this season in 189 at bats with 24 runs batted in. He has a slugging percentage of .466 and an OPS+ of 131. Yasmani Grandal is hitting .287 this year and he has an on-base percentage of .351. He has totaled 45 hits and he has driven in 23 men in 157 at bats. His OPS+ is 120 while his slugging percentage is at .471. The Dodgers have 465 hits, including 109 doubles and 62 home runs. Los Angeles has walked 209 times so far this season and they have struck out 461 times as a unit. They have left 365 men on base and have a team OPS of .768. They score 5.02 runs per contest and have scored a total of 271 runs this year. Milwaukee has a 28-25 overall mark this year. With an earned run average of 3.83, Jimmy Nelson has a 3-3 record and a 1.35 WHIP. He has 54 strikeouts over the 56.1 innings he's pitched. He's also given up 60 hits. He allows 9.6 hits per nine innings and his FIP stands at 3.41. The bullpen has an earned run average of 3.88 and they have given up 186 base hits on the year. Teams are hitting .253 against the Brewers bullpen. Their relievers have struck out 182 batters and walked 92 opposing hitters. As a team, Milwaukee allows 9.2 hits per nine innings while striking out 7.9 batters per nine innings. They are 14th in the league in team earned run average at 4.17. The Brewers pitchers as a team have surrendered 486 base knocks and 221 earned runs this season. They have given up 59 home runs this year, which ranks 20th in Major League Baseball. Milwaukee as a staff has walked 185 hitters and struck out 417 batters. They give up a walk 3.5 times per 9 innings while they strike out 7.9 per 9. Their team WHIP is 1.41 while their FIP as a staff is 4.17. As a team, they are batting .254, good for 13th in the league. The Brewers hold a .444 team slugging percentage and an on-base percentage of .327, which is good for 12th in baseball. They rank 11th in MLB with 8.7 hits per contest. Eric Thames comes into this matchup batting .286 with an OBP of .422. He has 46 hits this year along with 28 RBI in 161 AB's. He maintains a slugging percentage of .621 with an OPS+ of 170. Travis Shaw is hitting .296 this season and he has an OBP of .337. He has collected 56 hits in 189 at bats while driving in 36 runs. He has an OPS+ of 125 and a slugging percentage of .534. The Brewers as a unit have 461 base hits, including 100 doubles and 74 homers. Milwaukee has walked 181 times this year and they have struck out on 496 occasions. They have had 344 men left on base and have an OPS of .771. They have scored 5.09 runs per game and totaled 270 runs this season. Who will win tonight's Dodgers/Brewers MLB game against the spread?